From the apartment you can be easily reached the most 'beautiful beaches of Sicily such as San Lorenzo (less than 4 Km), Vendicari, calamosche ..
Good quiet location but the beach is not good in the area...You have the option to drive 10 mins to Mazarmemi beach! The property is clean and good and safe but very basic! The shower is really very small and no wine glasses!!!! Eduardo, Marzamemi has a small beach of clean water where you can bathe right in front of the house and a second beach 5 minutes walk away from home (probably you did not find it). In addition, Marzamemi is known for the small village, shops, restaurants and nightlife that it offers, not for beaches. Everyone who comes to Marzamemi knows that his beach is at San Lorenzo, which is less than 10 minutes by car no more than 5 (the rest in the ad is well specified how far away the beaches from home). Honestly to receive 3 stars for not having found wine glasses at home or not having read the ad well, I do not feel right. You have found a very clean house and provided everything you need for a quiet stay, in short. The shower have standard Italian measures. 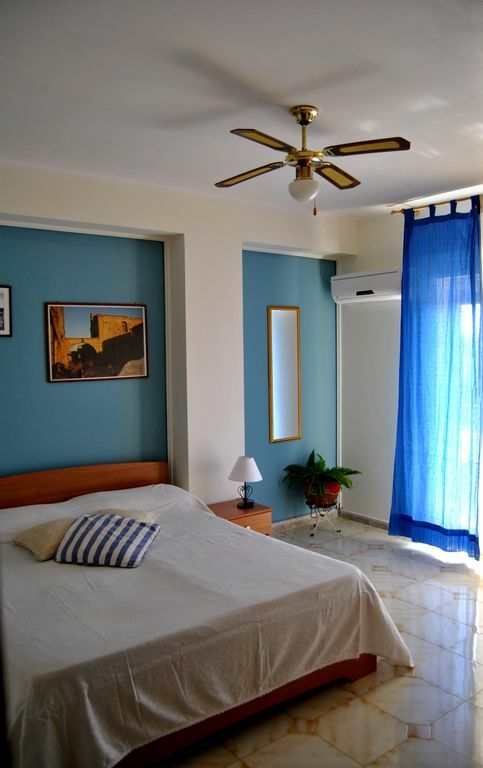 Great apartment, walking distance to Marzamemi shops and restaurants! We really enjoyed our time at Laura's apartment. It was very spacious, clean, and a great location. Highly recommended! thank you very much Elena! "Good location, clean apartment, nice landlords. Marmazemi is a nice little fishing village. We went there in June, which is a time of year I can highly reccomend because you have the village and the beach to yourself - no other tourists and still no Italians on holiday. If you''re looking for entertainment, shops, a variety of restaurants and stuff like that, Marzamemi isn''t the place to go. If you want to enjoy a quiet holiday instead with only local Italians around, go there. The apartment is huge, with a nice sunlit balcony. Everything was fine except the kitchen equipment. The kitchen itself is fine (gas stove, big fridge with freezer, pots and stuff) but there were no spices and no cooking oil. "Small but cosy apartment in a relaxed environment. Pool and the beach provides ideal condition for recreation. Good restaurants are in neighboring towns." Il soggiorno a Marzamemi è stato piacevole e la casa ideale per la nostra famiglia e secondo le nostre aspettative. Laura, molto discreta ma sempre disponibile per consigli ed informazioni. Se tornassi nella zona, se disponibile, prenderei sicuramente in considerazione questa sistemazione. Casa in ottime condizioni, c’è tutto ciò che serve, abbiamo trascorso un’ottima vacanza. Ospiti molto gentili. Arrival in Catania with direct flights from many Italian and foreign cities; from Catania leave buses that arrive in Pachino (Marzamemi) or Noto. You can also reach Catania with TTT Lines ferry that makes service from Naples to Catania, or by ferry Grimaldi you come from Genoa to Palermo and then to Palermo, by highway, you get to Marzamemi in about 3 hours and a half expressway. Below is the link to the official website of the State Railways, the only reference to date, complete with a notice of strike, and from Syracuse. The reference station for the arrival in Marzamemi is to Syracuse, to continue until Marzamemi is advisable to choose the route by bus Syracuse-Pachino. E 'was opened to traffic the new motorway CATANIA-SYRACUSE-GELA. E 'can get to Marzamemi much more easily and especially in less time, about 1 hour from the airport Fontanarossa. The motorway exit to get to Marzamemi is that related to the city of Noto, continue towards PACHINO, then towards MARZAMEMI. SPECIALTY 'GOURMET TYPICAL; ROUTES WINE; CULTURAL ROUTES; FISH PRODUCTS LOCAL. POSSIBILITY 'OF BOAT TRIPS.